Summary: During the past few years activists have broken free of the climate science consensus of the IPCC, considering it too conservative. This allowed free reign to their imaginations and voices, filling the media with warnings of extreme weather today and worse tomorrow. Once again the IPCC has published, so we can benchmark these threats against the current state of known science. The result is not the simple dramatic story told by activists, but has the advantage of being accurate. Will the news media listen, or continue to promote activists’ alarmism? 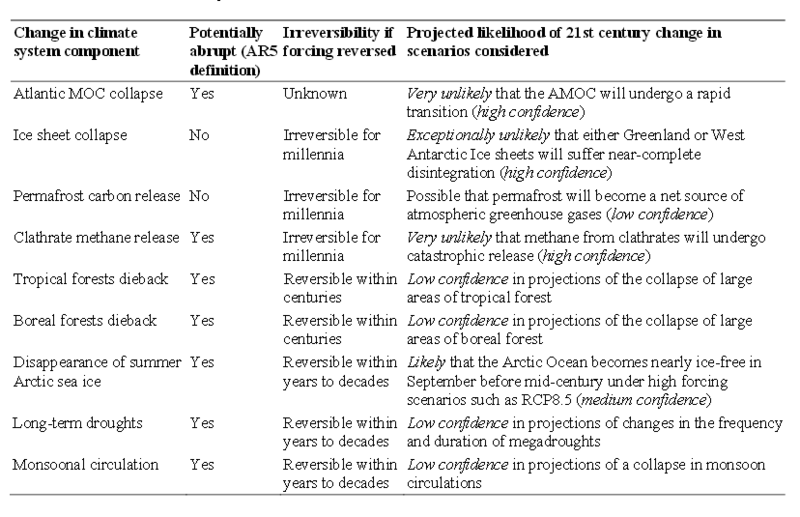 Here is the table that broke a thousand hearts, people who hoped AR5 would support their warnings about the certainty of imminent doom from extreme weather. Newspapers have trumpeted these warnings for years, usually with no mention of their probability. In fact most have lower odds than activists told us. 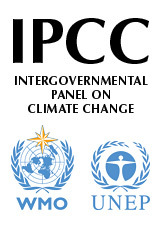 Many oft-mentioned threats did not even make the IPCC’s list. These findings in AR5 mirror those of the IPCC’s March 212 Special Report: Managing the Risks of Extreme Events and Disasters to Advance Climate Change Adaptation (SREX). Column 2 defines whether or not a potential change can be considered to be abrupt under the AR5 definition. Column 3 states whether or not the process is irreversible in the context of abrupt change, and also gives the typical recovery time scales. Column 4 provides an assessment, if possible, of the likelihood of occurrence of abrupt change in the 21st century for the respective components or phenomena within the Earth system, for the scenarios considered in this chapter. What do these probabilities mean? (1) The core scientific understandings remain unchanged. I do not share your defeatism, nor does history support your bleak use of “always”. The fantastic successes against air and water pollution in the developed nations during the past 50 years show that progress is easy once people decide to make it happen. The only way to make your depressing statements come true is to believe them. So please excuse those of us who work to produce a better future despite your advice.